A real duty to the Empire? When Britain declared war on Germany 100 years ago today the news was greeted with great keeness throughout the Empire. In Victoria The British Colonist reported that “Victorians Displayed Great Enthusiasm in Receiving News of Hostilities With Germany“. Large crowds gathered outside the newspaper office on Broad Street and the cheering reached fever pitch when Lieut.Col. 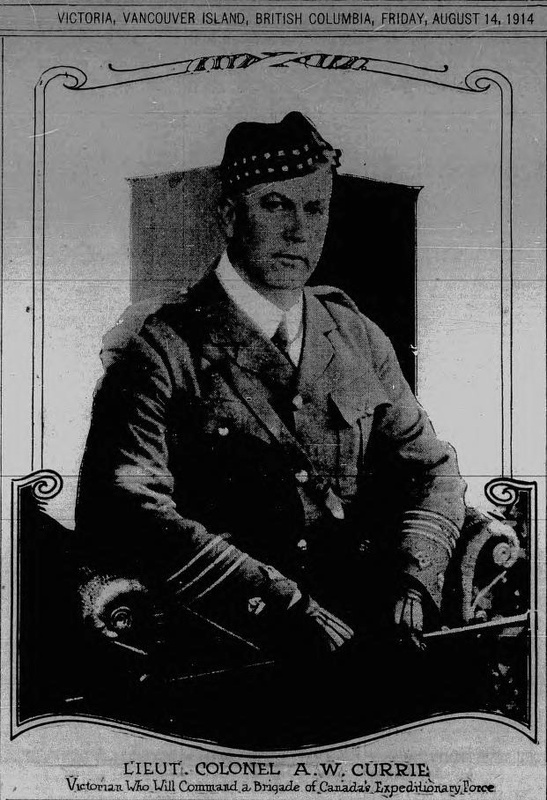 Arthur W Currie appeared with his 50th Gordon Highlanders. The skirl of the pipes eventually faded away but the general excitement brought about by Canada’s mobilization continued for many weeks. Canada’s enthusiastic reception to the outbreak of war may be a surprise to some Canadians today however it is a well-documented fact. 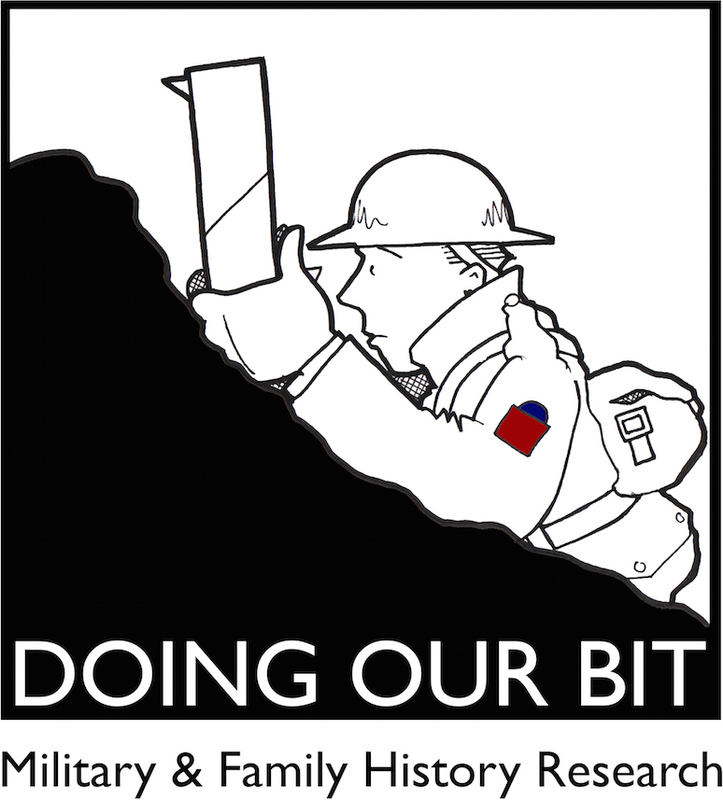 What is less well-known, and was surprising to me, was the extent to which local businesses jumped on the Great War bandwagon. In hindsight these advertisements may seem in extremely poor taste however these businesses and their patrons had no inkling of the carnage that lay ahead. 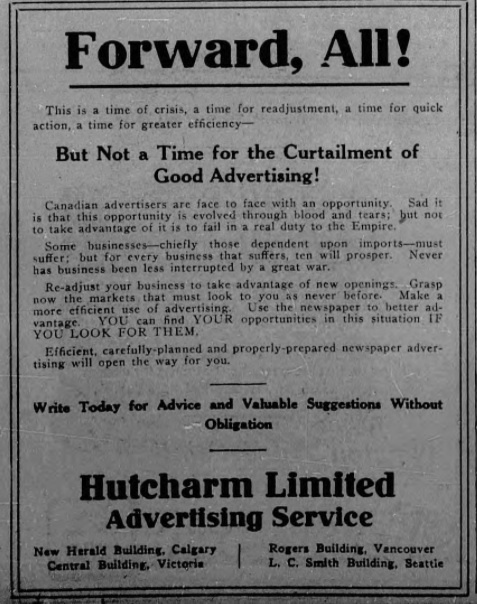 Advertising agencies such as Hutcharm Limited encouraged businesses to take advantage of the opportunity and stated that “Sad it is that this opportunity is evolved through blood and tears; but not to take advantage of it is to fail in a real duty to the Empire“. 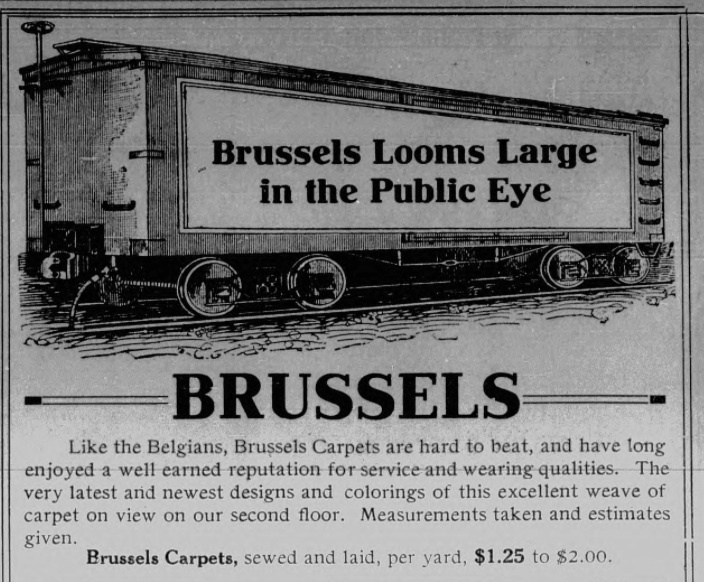 With advice like this it is less surprising, but no less shocking, that advertisers resorted to tag lines such as “Like the Belgians, Brussels Carpets are hard to beat” and “In Spite of War’s Dire Alarm the World Moves On and Still Leaves Them With their first thought – a Home“. Some businesses jumped on the bandwagon early and launched their new ad slogans days before the country found itself at war with Germany. By August 9th one of Victoria’s breweries was promoting War Ales and warning thirsty punters not to drink “German froth“. 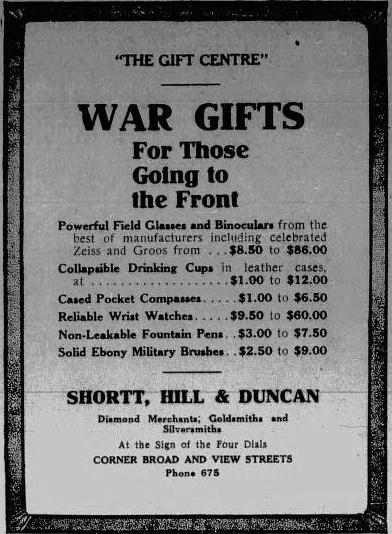 Five days later a local jeweller advertised “War Gifts for those Going to the Front“, such as powerful field glasses and collapsible drinking cups. Hutcharm Limited continue to encourage businesses to seize the initiative but by early September the opportunistic ad copy had been replaced by less jingoistic bylines. By October the newspaper was filled with ads for a variety of Patriotic Funds. Six months later they would jostle for space next to long lists of Canadian war dead. The image gallery below contains a selection of advertisements, in chronological order, featured in The British Colonist in August 1914.